Occupational hygienists and specialists use Apex Standard I.S. and the Apex Pro I.S. personal air sampling pumps to test for dusts, fumes, gases and vapors in hazardous, classified areas where explosive atmospheres may be present. 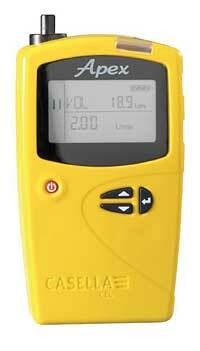 The units can be used for personal and area sampling. When used with a low-flow adapter assembly, the pumps have flow rates between 5 and 200 ml/min. A sample of air is drawn through tubes that absorb any solvents or vapors present. The tubes are then sent to a laboratory for chemical analysis. Data from the pumps is downloaded directly to a PC with a cable-free IR interface.